A Mile Zero Dance Salon featuring Zebra Pulse!! with Julia Sepkowski-Cook!!! AND WAAAAAAAAAAAAY MORE!!!! BUST! is curated by Edmonton’s original sound twister Shawn Pinchbeck. Shawn Pinchbeck is an internationally known sound and multimedia artist who has been active in Edmonton putting together diverse evenings of performance and festivals of electronic art and music since the mid-1980’s. For BUST, he puts on his curator hat and has lovingly assembled a few favourite local and Canadian acts. BUST! is a collection of diverse cutting edge performances and visual art featuring: sound art, electronic music, circuit bending, dance, performance art, visual art, VJ’ing, interactivity, and installation art. On the program is sound performances by Vector Rails, Robot Scout (St. John’s), Shawn Pinchbeck and Eryn Tempest, Ken Gregory (Winnipeg) with dance by Celine Cattoën-Gilbert, Sonja Myllymaki and Karen Porkka, Zebra Pulse, Mixtur with dance by Gerry Morita, and Wayne DeFehr. There’s also visuals by film projectionist Patrick Arès-Pilon, prints by Caitlin Richards and Eryn Tempest, and the Canadian premiere of the computer interactive sound, video and dance installation The Bather by Chris Driedzic (St. John’s), Susanna Hood (Toronto) and Shawn Pinchbeck. This event should not be missed for lovers of cutting edge sound performance, dance and visual art. It’s sure to continue the smashing success of Mile Zero Dance’s Salon Series; making a fun and diverse evening with some of Edmonton’s grooviest up and coming and established artists. See you there! 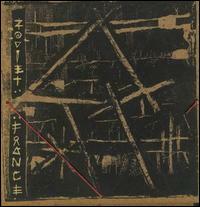 Playing very few live shows in their early years and mostly avoiding publicity, Zoviet*France offer very little context to their odd releases, which is, of course, the recipe to becoming a “cult” band. The sound collagists/ethnomusicologists/practical jokers have been putting out music since 1982, and although they eventually began to operate in a less mysterious fashion and no longer release albums with their infamously odd packaging, (notable examples being records in gauze bags or aluminum foil, an LP wrapped in roofing shingles, a cassette containing a cloth insert soaked in some sort of strong-smelling chemical,) they have never made the move towards using newer computer-based methods of generating cyclic noise, instead sticking with what they know best: the sound generating techniques that exemplify the best qualities of early industrial music. 1983’s Mohnomische is barking dogs, found sounds, world music, dying toy instruments, field recordings, etc., all disintegrating into strange ambient music veering suddenly from minimal to harsh; things that should sound familiar instead rendered alien and strange. Everyone is welcome to come out, show us your new noise, experiments, jam, whatever, anything can happen at an open mic/input. Dont forget your dancin shoes though, after the noise settles its Dance Party time! email rdp.noise@gmail.com, or talk to Parker if you want to play at this event.